Over the last week, combat actions of medium intensity continued in eastern Ukraine. The number of daily militants’ attacks varied from 42 on Monday, May 14, to 66 on Wednesday, May 16. 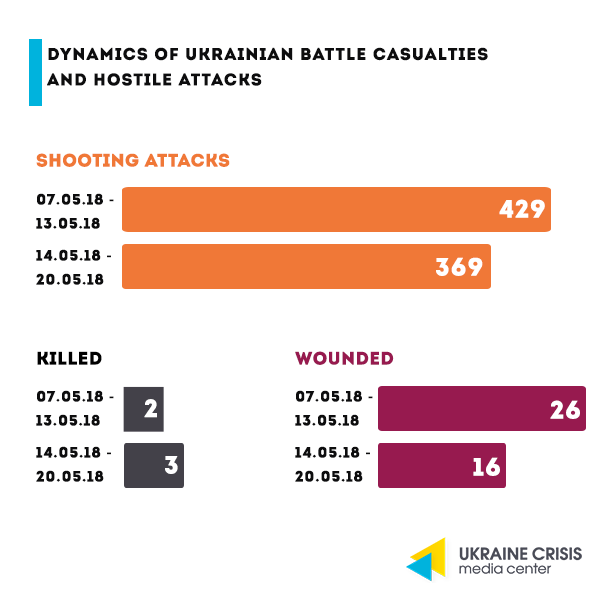 Despite the fact that the highest number of attacks is usually recorded in Donetsk sector, it is in Luhansk sector that Russia-backed militants started using the Minsk-proscribed weapons more frequently. Over the last week, Russia-backed militants were using the entire arsenal available to them, including 82-mm and 120-mm mortars, 122-mm and 152-mm artillery, as well as even BM-21 Grad multiple launch rocket systems. During the week, Russian proxies shelled inhabited areas six times. At about 06:00 on May 15 militants mortared Novhorodske with 82-mm mortars damaging two residential houses. On May 17, Russia-backed militants shelled Mykolayivka Druha and Svitlodarsk with 122-mm artillery. In the former, the attack resulted in three residential houses and two non-residential buildings damaged. In Svitlodarsk the building of the School no.11 and a civilian vehicle were damaged. On Friday, May 18, militants shelled the residential areas of Troitske with 122-mm artillery, resulting in four civilian casualties, including a 13-year-old boy and his father killed and the mother severely wounded. On May 19, militants shelled the civilian infrastructure of Zaitseve with 120-mm mortars damaging a residential house. On May 20, Russia-backed militants fired about 30 mortar rounds of 120-mm caliber upon Zaitseve destroying a house and damaging another two. OSCE SMM is still clarifying the number of civilian casualties inflicted last week. On May 17, Ukraine’s Joint Forces improved their tactical position by forcing the enemy out of Pivdenne town in Donetsk region. Diplomatic statements: Kurt Volker. 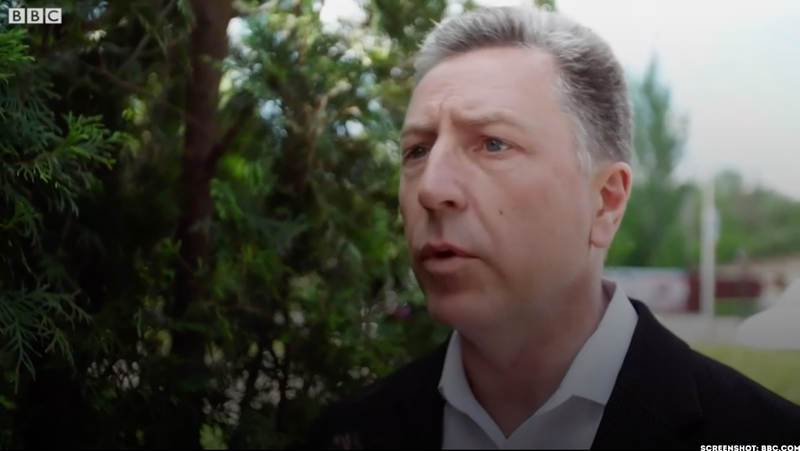 Ukrainians will not be able to return back the territories seized by Russia, the US Special Representative for Ukraine Kurt Volker said during his visit to Popasna in Donbas. “There’s no way the Ukrainians can take the territory back, which has already been taken by the Russians. Russia is just too powerful,” he emphasized. At the same time, Volker noted that the cost to Russia for a further advancement has already increased and will continue to increase. “And if that’s the case, then you have to ask yourself if you’re sitting in Moscow: ‘What are we getting out of this? We are getting Russian casualties, soldiers being killed fighting in Ukraine, for what?” he summed up. Volker also called on the Russian Federation to make another prisoner exchange in Donbas. The Kerch Bridge: a road to nowhere? 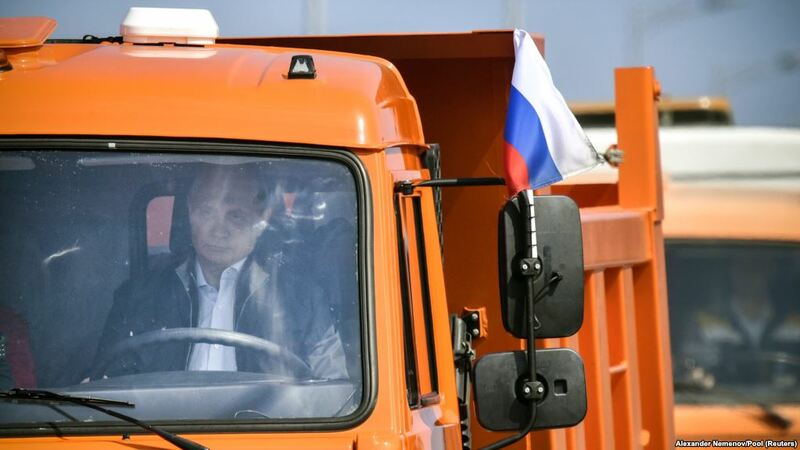 On May 15, Putin drove the truck heading the convoy of the construction vehicles across the Kerch Bridge to the occupied Kerch on the Crimean peninsula where he made a speech in front of the construction workers. The event was massively broadcast by the Russian media as well as lively discussed outside of Russia. Construction history. The first order to have the bridge constructed across the Kerch Strait was issued by the Russian Prime Minister Dmitry Medvedev amidst the operation for the occupation of Crimea, on March 3, 2014. A joint stock company was ordered to be set up that would further act as the entity commissioned to construct the bridge. The project chosen was the 19,3 km long bridge across the Kosa Tuzla (Tuzla Spit) island instead of the much shorter option crossing the Chushka spit. After the occupied Crimea came under the European and the US sanctions and it became clear that no private investment would come there, the project was considerably simplified. The designated state commissioner became the Road Construction Directorate “Taman”, the general contractor – “Stroygazmontazh” company of Putin’s ally Arkadiy Rotenberg. The cost of the bridge. As the contract was transferred to Putin’s allies its cost increased from RUB 28 billion ($449 million) to RUB 222 billion ($3,6 billion). The overall cost of the bridge including the approach roads and the security system approximates RUB 300 billion ($4,8 billion). Opening the unfinished construction site. On May 16, only the car lane not operating to its full capacities was officially launched. Construction of the railroad line is to be finalized next year. The full-fledged launch of both the road and rail connection through the Kerch Bridge is planned for December 2018. 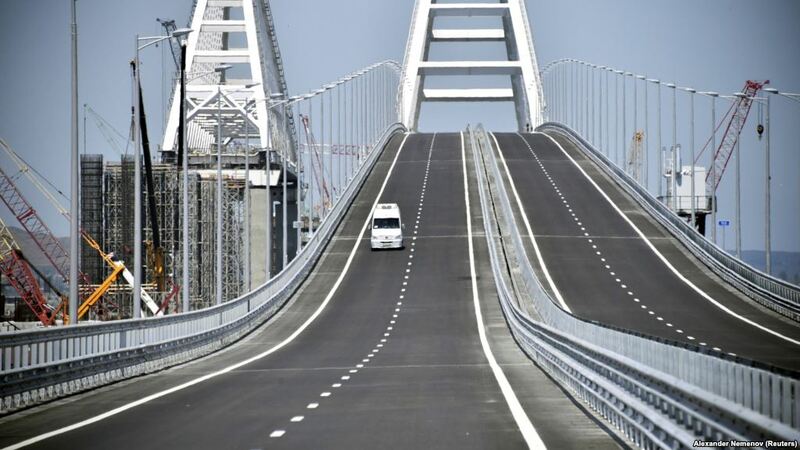 Limited traffic parameters for cars that were set upon the Kerch Bridge opening on May 16 demonstrate that the construction works are still underway. The traffic is only allowed for passenger vehicles with the speed limit of 90 km/h, while the project documentation ordered 120 km/h with no limits for trucks. What does Ukraine lose? In October 2017. an element of the Kerch Bridge – the steel arch over the road line – was installed above the navigable Kerch-Yenikalsky channel. It has thus limited the dimensions of the ships which can enter the Sea of Azov. As a result, the fright traffic to the Ukrainian ports of Mariupol and Berdiansk has decreased. According to Ukraine’s Ministry of Infrastructure, the direct losses incurred due to the passage limitations for vessels in the Kerch Strait to the Ukrainian ports amount to UAH 500 million annually ($19 million), while indirect losses reach billions of hryvnias (tens of millions of US dollars). According to the Prosecutor’s Office of the Autonomous Republic of Crimea (currently based in Kyiv), the damage caused to the environment of the Black Sea and the Sea of Azov by the construction is to amount at the very least UAH 10 billion ($ 381 million). Ukraine’s reaction. The bridge construction was not agreed with the Ukrainian authorities as it should have been in accordance with respective international treaties on the use of the Kerch Strait. Its actual height considerably limits the passage of ships across the Kerch Strait. Ukrainian authorities have spoken against the construction on numerous occasions. Ukraine’s Foreign Affairs Minister Pavlo Klimkin called the bridge “the road to nowhere” on Twitter. The President of Ukraine Petro Poroshenko added that the bridge “will be of use to the occupants when they will be urgently leaving our Crimea”. What’s next? Following the President Poroshenko’s order, a claim was submitted to the International Tribunal for the Law of the Sea to protect Ukraine’s interests with regard to the construction of the Kerch Bridge. Ukraine’s Foreign Affairs Ministry intends insisting to have the national and international sanctions on natural persons and legal entities involved in the bridge construction amplified. According to the opinion poll by the Institute of Analysis and Forecast conducted on May 3-15, 2018, in all Ukraine’s regions but the occupied territories of Donbas and Crimea, 59,4 percent of Ukrainians support Ukraine’s accession to the EU, 17,1 percent claimed to be against the move. 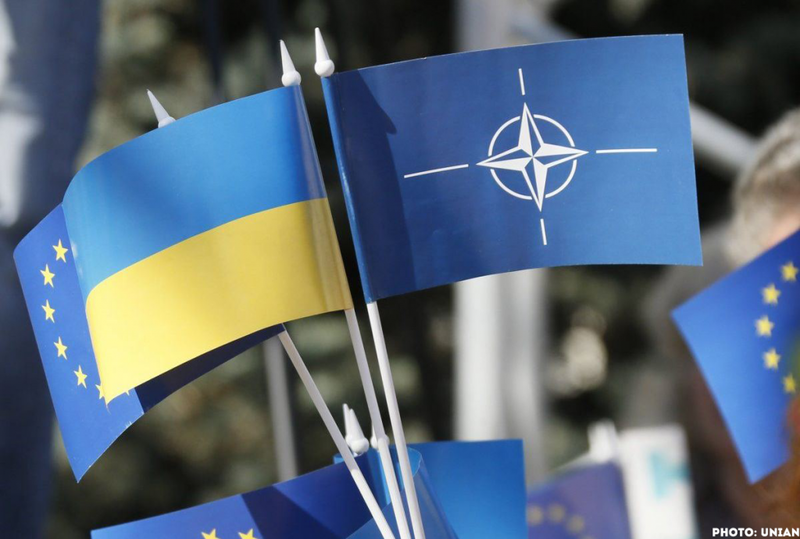 Ukraine’s accession to NATO is supported by 48,4 percent of respondents, 26 percent of the interviewed are against it. Ukrainian tennis player Elina Svitolina defeated the world’s top player – Romanian athlete Simona Halep, in the final round of WTA “Premier 5” tournament in Rome. The Ukrainian won with the 6:0, 6:4 score. The WTA title was once again conquered by the Ukrainian who preserved her 4th position in the world ranking.